where F is the lens f-stop, G is the guide number, and D is the distance. Whereas for electronic flash (strobe lite), the guide number depends only on the film speed, for flashbulbs a guide number is stated for a certain film speed, shutter speed, and film sensitivity (B&W or color). The reason that shutter speed enters the equation is that a flashbulb flashes over a relatively long period of time, and shutter speeds of faster than 1/30s cut off some of the light from the bulb. Flash reflectors are mainly 7", 5" and 3" in diameter. The 7" reflectors are generally used for screw-base (also called Mazda base) bulbs, such as the Sylvania Press 40, GE #11, and larger bulbs. The 5" reflectors are generally used for the "midget" bayonet bulbs, which are actually just slightly smaller than an egg. Examples are GE #5, Sylvania Press 25. The 3" reflectors are for the even smaller bulbs. There are various adapters for using the smaller bulbs in the larger reflectors, giving less light, but over a broader area, and with less hot spotting. The beam angle of the 7" reflector is 120°. The Graflite 5" reflector has a sliding neck adjustment. At the position marked "normal," the beam angle is 60°. 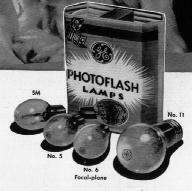 The General Electric #5 flashbulb was a staple of the press corps in the late flashbulb era. These bulbs are still readily found, warehoused in old camera stores, and can often be had for under $10/doz. When used with ISO100 B&W film, they give a guide number of about 200 at 1/100s shutter speed. Approximate 1,000,000 peak lumens, with 14,000-16,000 total lumen seconds output. For use in a 5" right-angle bayonet reflector, or a 7" medium base reflector with a screw-in adaptor. For more user/technical information, see the table. The Sylvania Press 25 was equal to the GE #5 bulb. It reaches its peak about 5ms earlier, and so stops action a little better. It's often considered slightly brighter than the GE #5, but you'd probably have to have a well-adjusted shutter and flash synchronizer to tell. For use in a 5" right-angle bayonet reflector, or a 7" medium base reflector with a screw-in adaptor. The blue-coated bulb counterpart to the #5. For color photography. For use in a 5" right-angle bayonet reflector, or a 7" medium base reflector with a screw-in adaptor. A long-flash bulb for use with focal-plane shutters. Not useful for 4x5 photography, because of the lengthly travel time of the shutter. A screw-base (also called Mazda Base or Edison Base) bulb, the about size of a 25-watt appliance light bulb. About one stop brighter than the #5. Approximate 2,400,000 peak lumens, with 18,000-22,000 total lumen seconds output. For use in a 7" medium base reflector. A screw-base (also called Mazda Base or Edison Base) bulb, the about size of a 25-watt appliance light bulb. About two stops brighter than the #5. For use in a 7" medium base reflector. Rather bright. The blue-coated bulb counterpart to the #22. For color photography. For use in a 7" medium base reflector. Rather bright. Smaller bulbs: M2, M3, AG1, etc. Smaller than #5 bulbs, these bulbs require an adapter to fit into 5" or 7" reflectors. In such a reflector, they provide an even light. Flash synchronization time may differ from #5. Flashbulbs are much safer than the old "flash powder" they replaced. Accidents with intact coated flashbulbs were said to be rare; nevertheless, flashbulbs should be considered incendiary devices capable of causing bodily harm to the user or persons nearby. Static electricity may cause flashbulbs to self-ignite; consequently, always handle bare bulbs carefully and always keep bulbs in containers until used. Strong electromagnetic fields may cause flashbulbs to ignite. Exercise care around radio transmitters (including cellular phones), and perhaps even airline X-ray machines. Airline regulations may prohibit flashbulbs in baggage or checked luggage. Do not use in an explosive atmosphere, such as near a gasoline station, natural gas site, or in a coal mine. Newer flashbulbs have a clear or blue-tinted safety coating; however, if uncoated or if the coating has been damaged, a bulb may shatter when flashed, producing a spray of hot glass fragments. When using a flashbulb near people, use a safety shield over the reflector. Do not carry flashbulbs in your pocket. Static electricity or other forces may cause the bulb to flash, causing severe burns. Many retired press photographers have leg burns because of this unwise practice. A flashbulb in contact with another bulb which flashes will also flash. Take care when handling a box (or bag!) of bulbs. Browse to Flashbulbs for more general information. Move on to Flashbulb Equipment Recommendations.